We are a database of Negative Exposure Assessments for the construction industry for lead paint work and non-friable asbestos abatement. This data is updated several time per year for all tasks, as work is available to monitor. The NEA is based on following proper engineering controls and good work practices while doing the all work. These air levels can be met by following the details, tools, and equipment to properly handle the work and when doing Good Work Practices, which means use the tools, equipment, & supplies to attain these safe work levels. The lead based paint work exposure assessments will help you work lead safe to keep all of your employees below OSHA Permissible Exposure Limits and/or Action Levels for lead. Click on the Lead Section and pick the type of work you will be doing, click on the detail of the specific work, and get your air monitoring / exposure assessment for that task. The non-friable asbestos work listed in the database for Negative Exposure Assessment will help your company keep its employees or subcontractors safe from asbestos. Click on the Asbestos Section and then pick the type of work you will be performing, click on the detail of the specific work, and get your air monitoring / exposure assessment for that task. OSHA Air Monitoring, LLC has developed this exposure assessment database to help contractors around the country keep their employees safe of air contaminates of lead and asbestos. If Federal OSHA or your State OSHA Dept were to come on site and ask about your firm work safe you will be able to click on the task and prove your are at a safe level. There is not a listed amount of lead under OSHA but only safe levels of air while doing the work. 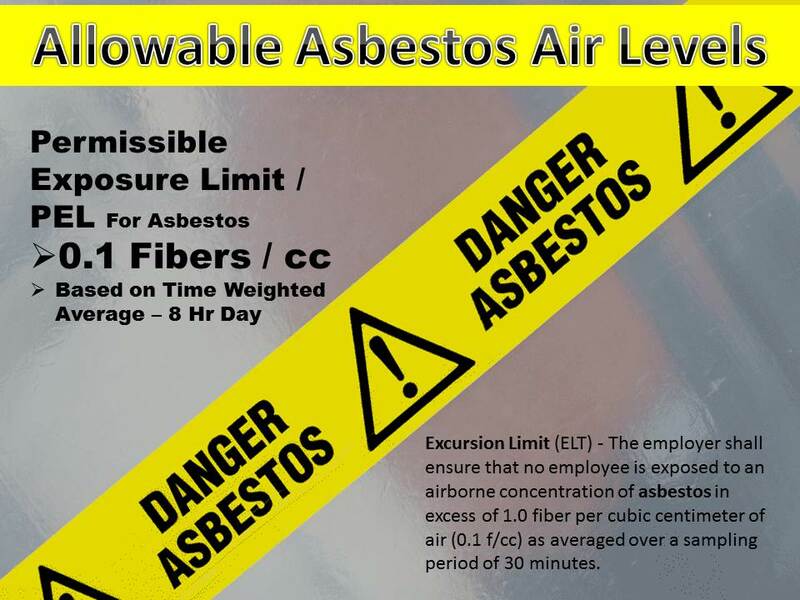 For non-friable asbestos work you can now prove your exposure is below the PEL and/or excursion limit for asbestos and your crews are working safe. Join Today with a Subscription for all type of Exposure Assessments for Lead & Asbestos work. * All Subscribers will be required to provide a secret login question. Any unauthorized sharing of data is not allowed.